NEW PROFILE PHOTOS, SPRUCING UP MY ABOUT PAGE, A FEATURED POST SLIDESHOW AND SETTING UP A NEWSLETTER. Phew! I can't tell you how excited (and relieved) I am to finally be crossing these four things off my blog to-do list. Last month I signed up for the Creative Live Build a Successful Creative Blog class with April Bowles-Olin of Blacksberg Belle and it was definitely one of the best things I could've done to help me stop putting things off and figure out what I need to do to make this blog better. If you're interested in April's Creative Live class you can watch a free 30 minute preview all about setting your blog goals or buy the whole class at the reduced price of $59 for the next 34 days. I highly recommend it. First up, my about page. This is something I've been meaning to do for what seems like forever. It's finally got some shiny new photos, a few of my favourite projects and links to some of the lovely people who have shared the things I've made. Next, new headshots. I have the ever patient other half and his fancy pants camera to thank for the lovely new profile photos now gracing this blog. It's not easy to take a picture of someone who a) can't seem to keep their face still and b) is probably going to hate every single picture you take because of this but somehow he managed it. A featured posts slideshow. I've been searching and searching for a simple slideshow gadget for blogger that is just that, no checkerboard fades here please, so this truly simple slideshow gadget from Code It Pretty is exactly what I've been looking for. If you have a blogger blog you might want to check it out as well as everything else on that blog. It's all gold, I promise. And lastly but definitely not least, this blog now has it's own newsletter. It's going to be filled with even more of the things I love and hope you will too, exclusive diy's only available to subscribers and sneak peeks into upcoming projects. 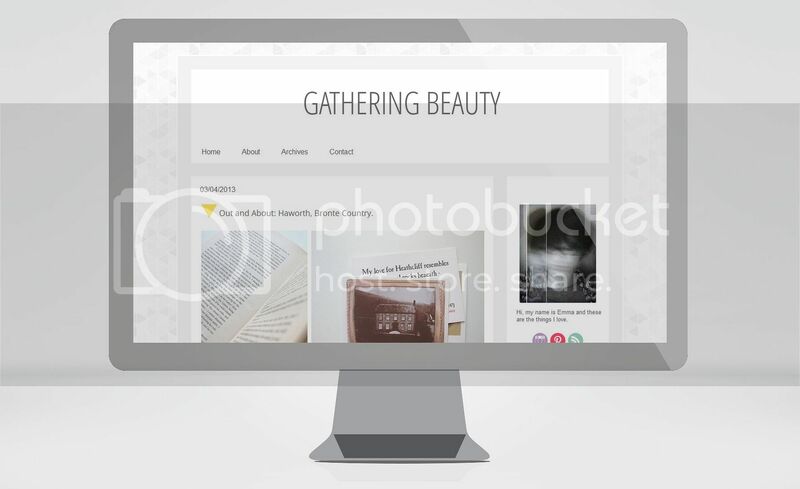 You can sign up the Gathering Beauty Newsletter here as well as email updates of the latest blog posts. BLOG DESIGN TIPS AND TRICKS. PART 2 - HOW TO MAKE A BLOGGER BLOG NOT LOOK LIKE A BLOGGER BLOG. Here's a few more tips and tricks to help in designing your own blog. This time how to make your Blogger blog not look like a Blogger blog. I love Blogger and I know a lot of other people do too but sometimes that means you get a lot of blogs that look exactly the same and just like a Blogger blog should. Here's a few ways you can customise your blog and make it stand out from the crowd. Create a custom header with navigation links. Remove the blogger navbar at the top of your blog. Remove the box shadows surrounding your images. Remove the 'Showing posts with label ... show all posts' box. I know Blogger recently changed the way you edit the html in your blog. A lot of the tutorials out there ask you to select the 'expand widget templates' box which doesn't exist anymore. If you get stuck, like I did, you should read this post over on Code it Pretty about how to use the new template editor. It really helped. And finally, if you want to start from scratch with a blank page Pugly Pixel has a great tutorial for creating a static website out of a blogger blog. 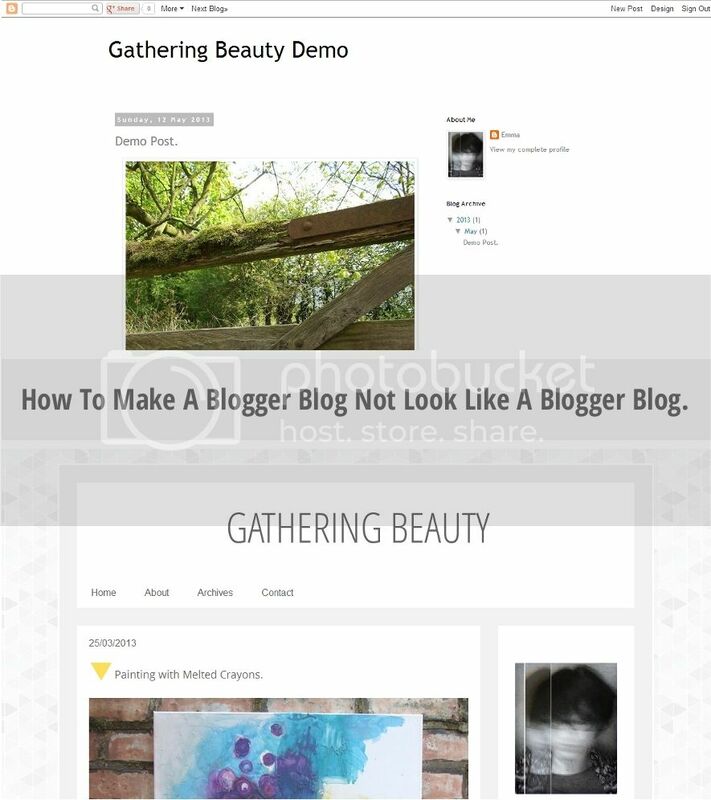 It shows you how to remove all the standard blogger attributes including the pesky dashed border at the bottom of the page. If you missed it here's Part 1 Blog Design Tips and Tricks - The Basics. Next up, Part 3 - Making your blog pretty. BLOG DESIGN TIPS AND TRICKS. PART 1 - THE BASICS. I came across so many great and free resources when designing this blog that I thought I should share them with you all. I'm definitely not an expert when it comes to blog design, I'm much more of an enthusiastic beginner but here are some of the tips and tricks that helped me along the way and might help you too. Getting Started. Don't Fear the Internet. If you're totally new to html and css (like I was) then these videos are a must watch. They explain all the basics in such a way that even non-web designers like me can understand. I can't recommend this site enough. Hamburger text markup language anyone? Pugly Pixel is another great resource. In fact if you haven't already you should probably go and bookmark this site now, I'm going to be referencing it a lot. Everything on Katrina's site is brilliant including these videos on html and css. They're well worth watching. 15 Minutes to a Better Blog to keep you busy. Another one from Pugly Pixel, this time guest posting over on A Beautiful Mess with 10 Simple Blog Layout Tips. This is a great one to refer back to, I'm still working on number five. And finally a tip from me and the most important thing I've learnt by far. Always, always, always back up your blog before your make any changes. Trust me, you'll never be sorry you took the extra time to do this. You can find Part 2 - How to make your blogger blog not look like a blogger blog here.